For our seventh block in Pat Sloan's Free 2014 Mystery BOM, Globetrotting, we travel to Sydney Australia. Please click on the block picture below for a printable copy of the pattern. 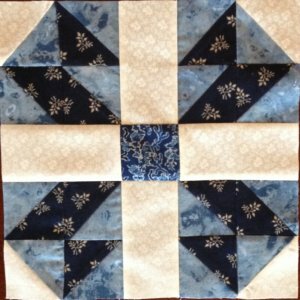 When looking at the block and the fabric chart fabrics 1, 7, 8, 9 were used. 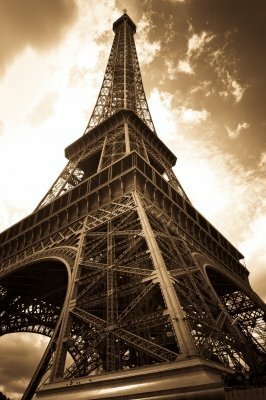 This month Pat relives her youth in Europe and the times she visited the city of lights with a wonderful block. So stroll along with us as we add this next-to-last piece to the great puzzle. You knew this was coming didn't you? Paris France, what woman wouldn't put Paris on her travel agenda? Pat has been to Paris twice, both times she was a teenage girl living in Belgium. Both times she took the train into the city. The first time was very magical. Pat went with three other girls and had a hotel for two nights. They walked the city, Pat bought a scarf that she still has somewhere. They bought skirts in a back alley kind of place so that they could say 'oh yes.. I bought this skirt in Paris'! They didn't have much money, so food was pretty basic, but she does believe her love of French Onion soups started on this trip as that was one thing they could afford when they sat down in a restaurant. Going back to Paris as an adult is high on Pat's list. She wants to see the city with a different eye. "I'd also like to be there for a week or so" .. to really absorb the atmosphere and take her time. 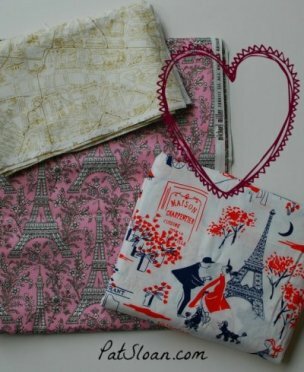 Until that happens, she has decided to collect Paris themed fabric, but it HAS to have the Eiffel tower on it.